Last weekend I rented a conference bike with my family at the Dutch Bike Shop on Ballard Ave. 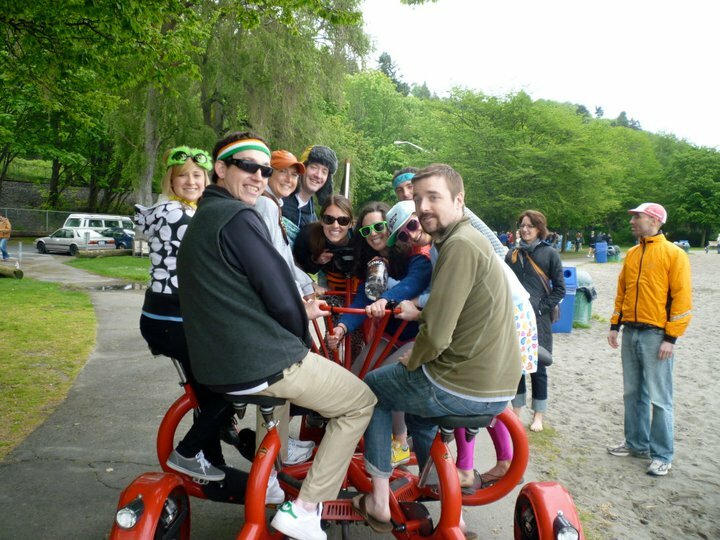 The seven of us rode together on the one-speed, bright red bike through Ballard to Golden Gardens. We got a lot of waves and thumbs-ups and a few people even pulled their cars over to take pictures of us. Several friends came to meet us at Golden Gardens to take rides on the bike and help with the trip back to Ballard later that afternoon. I was surprised by a.) how much exercise I actually ended up getting and b.) how much laughing and conversing (conferencing?) happened on the bike. Throughout the previous week I had been feeling pangs of anxiety about leaving my life in Seattle and doing this trip, but the conference bike was a much needed reminder for me of what inspired me to write my Stevens proposal in the first place. Biking is fun! Some people have even asserted that biking can make you happier. Biking helps you stay fit while getting you where you need to go and requires no fossil fuel consumption. Also, I’ve never spent more than a minute looking for a place to park a bike—with the one exception of looking for a place to park the car-sized conference bike. Riding around Europe on a bike….sounds happy-making to me! And don’t forget…you are working…don’t have TOO much fun. Go, CMG, go! You are an inspiration.